Home / Drama / Essays. / Introduction to Drama / J.M. 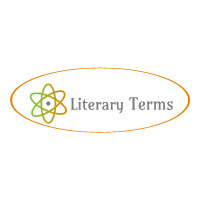 Synge / The Role of Sea in "Riders to The Sea" by J.M. Synge. 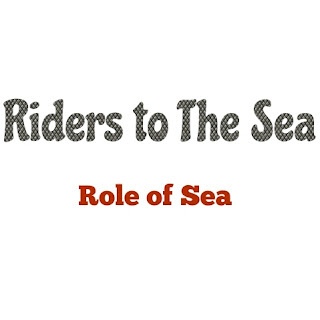 The Role of Sea in "Riders to The Sea" by J.M. Synge. Synge uses nature as a background, character and symbol in his plays. Nature is the protagonist in many of his plays especially in “Riders to The Sea” where nature fills the minds of the characters and mounds their actions, even their moods and fate. The play is dominated by fate. In “Riders to The Sea” the sea represents fate. The sea is a great factor in the life of me people of the Aran Islands. It is the source of their living, and at the same time devours the man-folk as they go out for earning their living. Moreover, the sea gives them passage to the markets at the mainland where they go to bye or sell things. There is no alternative for them but to ride the sea to maintain their family's existence. All the man-folk of Maurya were devoured by the sea when they ventured to the sea to earn their living. Thus the sea is a hungry demon devouring the humans that comes its way. The sea is indeed the most impressive character in the play. As the play begins the sea appears as a terrorising living personality. Cathleen can't believe that the shirt and stocking removed from a drowned man can be Michael's. But mysteries are the ways of the sea. It has taken the dead body of Michael to far off Donegal in the course of the wanton play of its waves and current. “The sea can do no more harm to her”. This is the heart rending sorrow of the bereaved mother. Some critics consider the sea as a Villain of Maurya's life causing the tragedy of her life. But it would be wrong to consider the sea as the villain because being a powerful element of nature is is governed by its own moods like anything else in nature. Besides, the sea provides livelihood to people as it does to the Maurya family too. We may therefore say that Maurya was fate to suffer at the hands of vagaries of the sea. 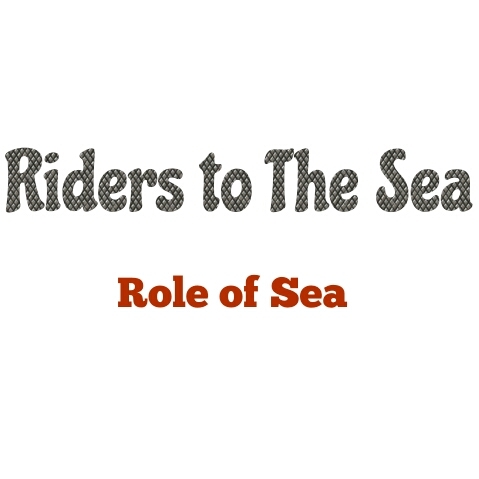 In “Riders to The Sea” Maurya’s family members fall victim to the fury of the sea. But it was their fate to be caught up in a tempest on the sea all of a sudden and be killed. Bartley's life could be safe if he had listen to his mother's advice and if he had not gone to the Galway fair. He decided to go to the fair to sell the horses because he thought that it was his duty to look after his family as there was no other male member alive in the family and there was no other boats to go to the fair for two weeks or more. So it is necessity of the family for which Bartley felt compelled to go to sea. So it is not the fault of the sea for which Bartley died. Thus Nature in the drama is a background, a character and a symbol. The processes of nature have only worked for man's woe. It is the agent of the fate which is the most inevitable element and which affects the life of the Maurya’s family relentlessly. Nobody could do anything about it at all. They just had to accept their lot. If it were hot her destiny to suffer Bartley would have postponed his visit to the Galway fair. The ruthless and cruel hand of Maurya's fate forcibly led Bartley to his death to complete her tragedy. Thus it is the inevitability of fate which in the shape of Nature dominates the action of the play.